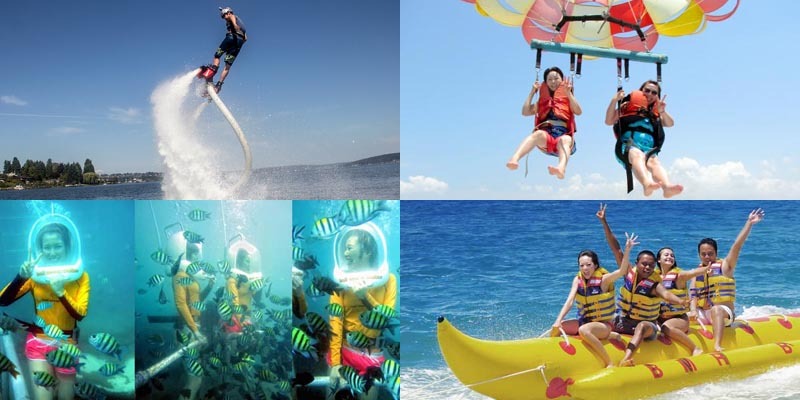 Bali Water Sport Activities at Tanjung Benoa is an exciting adventure at Nusa Dua to pump up adrenaline with varieties ocean games to have full of fun holiday. 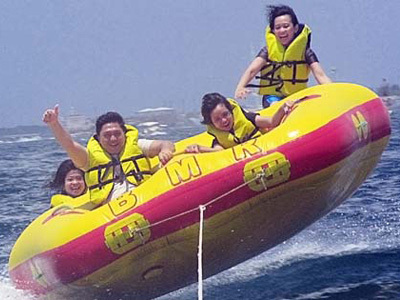 Bali Water Sport Activities At Tanjung Benoa offers all the sea water games you might think of. And also probably some of them you did not know yet and it is the time to have fun. 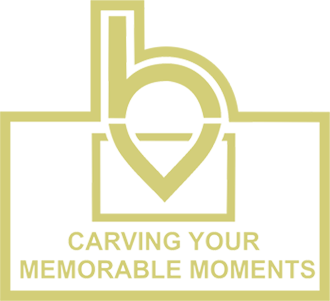 Our Bali tour driver will pick you up and drop you off back to your hotel. 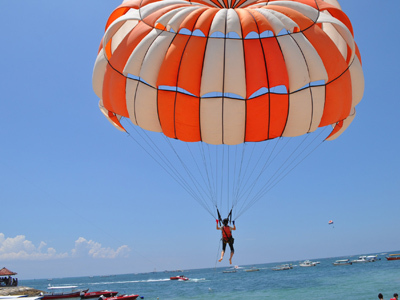 Parasailing is basically a parachuting. It starts from the beach sand area, not like parachuting that started with jumping from the plane, and it needs a good wind blowing through the parachute used that is why it mostly played around the beach due the wind always blowing nicely there. Once you were tagged on to the parachute, a speed boat will drag the rope connected to your parachute and pull you just like a kite. 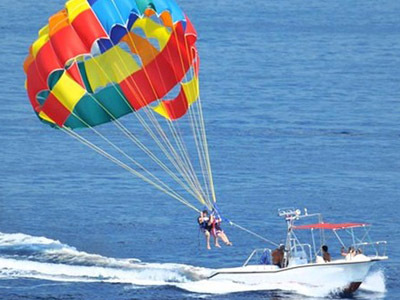 Adventure Parasailing is another development of regular parasailing. 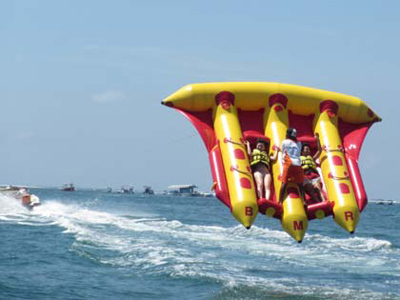 If the regular parasailing will be started from the beach sand area, this one will be started from the top of speed boat pontoon. You need to go to the pontoon first in the middle of the Ocean side and you will start the game and landing on the same pontoon. 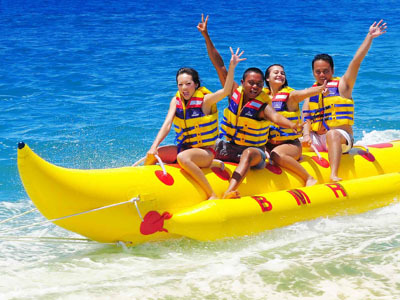 Banana Boat is long shaped rubber boat and really looked like a banana. To play this game, you have to holding on to the rubber boat tight due it will be dragged by the speed boat with high speed and it will be zig zag on the sea water. Water stream from speed boat in front of us will be like challenge and sometimes our rubber boat could be turned upside down but it will just make the day more fun. Jet Ski is basically riding a motorcycle but you are not ride on the road, you will ride on the sea water instead. 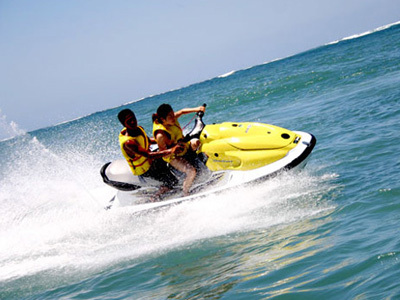 The position you ride the jet ski is same like the motorcycle but the differences are the engine of jet ski will inhale the sea water from its middle front side and the blast it out from your rear and produce a strong power to move the vehicle. Also it has no brake on it and you have to brake by turning immediately while release the power off like a drifting on water. Fly Fish is short of a big rubber kite with wide surface like a wing to enable it fly. We will attached on the top side, it will be on the back side when it is flying, and it needs 2 person attached at the same for the balance of right and left hand side. One instructor will be stand between the 2 players to maintain the balance when it is flying on the air. Donut Boat is another style rubber boat the dragged by a speed boat. The way to play the game is as simply as holding on to the boat tightly so you will not fall to the sea water. It is almost the same like the Banana Boat that will jumping on the sea water stream but it is more difficult to get upside down. 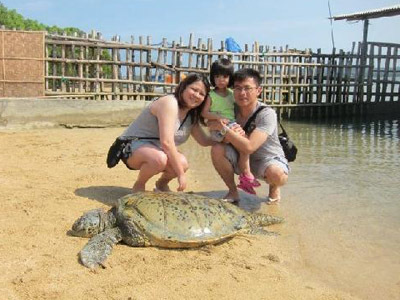 Turtle Island is a very small island that is naturally the habitat of Turtle. Every breeding season, groups of turtle will come here to put their eggs under the beach sand for the next generation of Turtles. In order to help small turtle to get better chances to grow up until they are ready to swim in the ocean, the locals built a turtle conservation center in the middle of the island. To reach the island we will use a glass bottom boat and we could see the underwater life clearly from inside without going inside to the water. Fly Board is a brand new water games with high challenges. 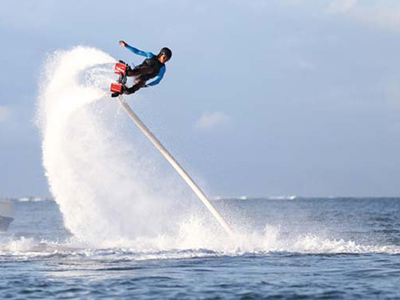 The Jet Ski engine will be inhale the seawater and flows to fly board equipment that attached to your feet. The instructor on the Jet Ski will manage the power of flowing water that blasting from Fly Board equipment on your feet and you are the one who will do some trick movement while flying like jumping in and out the water, doing a circle turn on the air and etc. It is definitely an exciting and heartbreaking sea water activities. Snorkeling is swimming with snorkel and swimming goggle equipment. The swimming goggle will protect our eyes when going swim inside sea water and help us to see clearly under the water. The snorkel is used for keep a small amount of oxygen that is enough for about 1 or 2 minutes breathing under water and we can easily go up to have another fresh oxygen supply. Diving is going much deeper into sea water to have a look the beauty of underwater life. 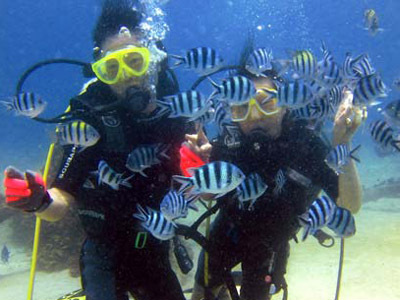 You will using complete diving equipment such as swim suit, oxygen tank attached on the back, fish foot fin, and etc. 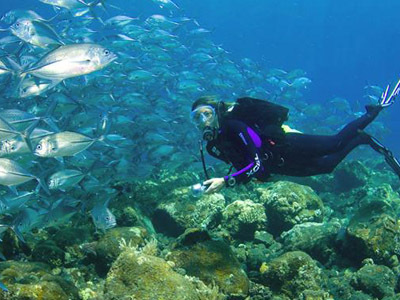 With oxygen tank on your back you can stay longer up to 30 – 60 minutes underwater due it is connected to your mouth to supply the oxygen from the tank to your breathing system. Power Dive is the development of diving tools that remove the oxygen tank from your back. The oxygen supply will come directly from the tank on the boat on the water and you will be attached with a tube that goes directly to the boat above. It will make you even can dive longer than a normal dive and you will move easier without the oxygen tank on your back. 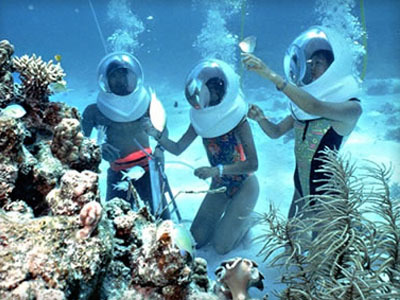 Ocean Walker is another development of underwater sea exploration and it is the easiest one. You will be wearing a helmet attached with oxygen tube to the boat and you will be looked like an astronaut but under the sea water. No need to learning about the breathing technique with the equipment like diving, it just plug and play. You just breathing like on the ground and you can enjoy the beauty of underwater life.